Belle of the Literati: Do You Belong Above or Below? Do You Belong Above or Below? "No bond is the same as that between sisters." Not gonna lie, the whole idea of the Lost City of Atlantis is something that has always fascinated me...as well as The Little Mermaid but I digress. So the idea of Atlantia and how people still live Above an incredible idea. My favorite part of this book was unraveling the mystery of how this underwater world came to be. We meet Rio in the beginning of the book and it is the anniversary of the Divide, the time when people were separated Above and Below. At this time and their age, they are able to decide if they choose to stay Below or go Above and work to provide for those below. This felt so Divergent mixed with Hunger Games sacrifice that I was immediately drawn into the story. The story starts to get very interesting when Rio tells us all her life she has longed to live Above and her sister has always wanted to stay Below...well that's not what happens. In a twist of circumstances we are not privy to yet, Bay (her twi sister) decides to go Above, leaving Rio stranded Below with no explanation as to why she left. Dun dun dun. From there we learn that not all is utopian in this underwater world and the secrets start to pile up to the coast. The steady reveal of the Sirens in the world as well as what really happened in the divide was paced really well. The idea that this society can actually live and function under the sea is fascinating. I loved learning about the background of how things function and to learn that corruption seems to be at it's heart is something that kept me reading. What the hell happens if something leaks?! What if the Above got pissed and tried to infiltrate the Below? All burning questions I had while reading because this book has a premise that is extremely intriguing that I HAD to keep reading. At the core of this story though is the love Rio has for her twin Bay. She is shocked, hurt, angry, and fifty other shades of emotion after her twin leaves and she refuses to just sit Below and accept it. She plots and confides in her secretive aunt in order to find a way to get Above. The bond her and her sister have is beautiful and the lengths they go to for one another are inspiring. I love reading a good sister story because I really don't think enough positive sister relationship books exist out there *coughTheBronzeHorsemancough*. I have two sisters who I would go to the Arena and back for so I love books that explores the delicate yet stronger than steel bond that sisters have. While I am incredibly pleased I was able to read a fantasy/parnormal this is a standalone novel, I can't help but think this world and plot could have easily been extended into a very dynamic and engaging trilogy. There is SO much we learn about the Divide and I think there really could have been a lot of development between the worlds beyond just this book. 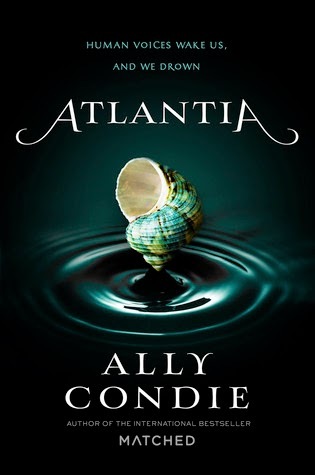 If you love paranormal, long to live out your Little Mermaid fantasy, and standalone books...this one is for you. Wait! There's more! Enter below to win an Atlantia necklace from Penguin with dirt from Above or sand from Below! I do love the sound of the sisterly bond in Atlantia, and I do think that the concept sounds pretty darn fascinating too. But there's still something that is holding me back from being eager about reading this one. Perhaps, if I see it at the library, I'll grab it and give it a shot!